Finally someone was able to stop Ted Christopher. Yeah, Chuck Hossfeld has won one night, but besides that TC has won the other four races. That is until Thursday night. A new face shined in victory lane. And for Kevin Goodale, beating TC was sweet, but grabbing his first career Mod win was even sweeter. “I cant tell you how it feels, said an pumped Goodale after his win. “To beat teddy Christopher, it doesn’t get ay better than that. “This is the third year we’ve been coming here. We figured out what it was all about the first year and knew we wanted to win after that. And it wasn't exactly an easy journey to get here. Goodale and the team had to haul down from Long Island with heavy hearts. 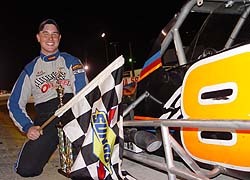 The big win has Goodale psyched about the final two nights of racing at Smyrna and the up-coming Whelan Modified Tour season. Christopher, who finished second, was able to pass Goodale for the win the other night but had nothing for Goodale on Thursday. Goodale was in a league of his own and left TC and the rest of the field in the dust. Kevin Goodale had one of the best nights of his career on Thursday. “I was just way to tight to do anything with Kevin,” said TC. “He's been running good all week. Gotta give him credit for the win. He started up front there and got away. It was only the second time during Speedweeks that someone was able to beat Ted Christopher. “It's not like they really beat me. They start in front of me and beat me. I guess that is one way to do it. We are running good. It went his favor his night and maybe tomorrow it will go in ours. Andy Seuss was happy with his top-five finish. Andy Seuss has had an up and down Speedweeks. 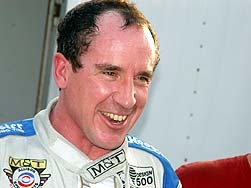 But on Thursday night, the New Hampshire Mod driver was all smiles after a great 5th place finish. “For Speedweeks this was our best run so far, said Seuss. “I'm excited. The car was awesome. It was a little free at the end but we had enough to stay in the top-five. Seuss held off a charging Chuck Hossfeld by inches across the line to get fifth. They say being consistent is good. Eric Beers has been just that. Problem is...Beers wants more than that. The Pennsylvania driver hasn't won a race yet in this year's World Series at Smyrna, but again had a nice third place finish at the end of Thursday night. “We changed engines today,” said Beers. “We blew a head gasket last night when we finished third. We pretty much changed everything in the racecar. We went back to a setup that we ran five six years back. I'll tell you what that thing is a lot better. It turns on a dime and gets off of the turns real good. I'm real confident about tomorrow night. “The car was the best tonight it's been all week. We were faster than Teddy but he never really know how to hold his line so there is no room to get by him. I had two good runs getting up next to him there. I could have sent it in and maybe made it or wrecked both of us. For Zach Sylvester, his Speedweeks can be described as a test of will. Night after night he and his young crew work their butts off and so far have not had much to show for it. Last night was no different for the 2004 NASCAR Mod Tour Rookie of the Year. He started on the pole but spun on the second lap in turn one and two. Zach Sylvester spun early and it ruined his shot at a win on Thursday. “I thought I was along side of him getting in,” said Sylvester after finishing 12th. “I was as low as I could go. We just connected. Whether I moved up or he came down, I don't know. I was just trying to get to the front early and get away from everyone. “It is no ones fault when it comes down to it. Maybe I was at fault in being little too anxious at the beginning. 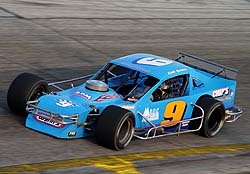 The SK division at the World Series of Stock Car Auto Racing has been full of fantastic finishes and some good racing. 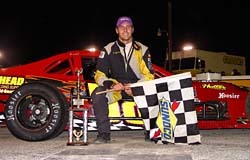 On Thursday night, one young driver held off a Mod Tour star to get his first win at Smyrna. If you know Modified racing in New Jersey, you know the name Reed. Harry Reed was a veteran of the Mod wars for years at Wall Stadium. Now his son Steve is the Reed in the spotlight after holding off Eric Beer to win the SK race. “It is indescribable,” said Reed. “You get the best of the best from Daytona show up and come over and shake your hand because they know your father. They don’t’ really know what to expect from you. You hope you have a good night, then you end up balled up. I don’t know if I could do it if it wasn’t for the guys behind me and for my father. Steve Reed had a big night in the SKs. If you thought you were seeing double at Smyrna on Thursday, well you sort of were but not. 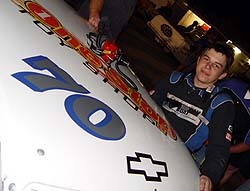 Teddy Christopher's twin brother Mike, was behind the wheel of Joe Brady's #00 back-up car as a teammate to his brother. Mike finished 11th. Donny Lia had his second good run in a week filled with frustration. Lia won the pole with the quickest time in qualifying. After the redraw, Lia started 7tha and wound up 4th right behind Beers at the finish of the feature. Eddie Flemke and the Roger Hill owned “Hillbilly Racing” team worked on their tore up racecar and had it ready to go after hard contact with the wall on Wednesday. Flemke finished 8th. The team will unload their other car for the big Richie Evans Memorial 100 on Friday night.